When you need a sturdy case to protect expensive equipment during transport or travel, who should you turn to? Pelican. 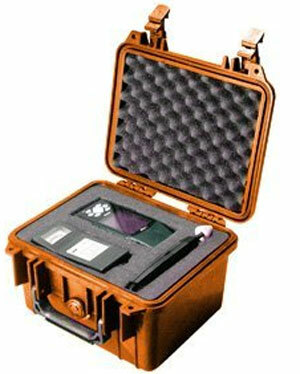 While I prefer Otterbox’s waterpoof cases for my smallest gear, Pelican is the name for medium and large cases. No joke, these cases are nearly indestructible! Pelican cases have a lifetime guarantee and are waterproof to a depth of 1 meter (3.3 feet) for 30 minutes unless explicitly stated otherwise (such as with their micro cases). My favorite exception clause ever – guarantee does not cover shark bite, bear attack or damage caused by children under five. Pelican case prices are typically fixed across the board, so I will usually just order from Amazon for the free shipping.